Buses have come a long way since then, but while some things have improved, others have got worse. Another memory revived, thanks Aiden. My dad drove the bus out of Queens road shed, now apparently the museum. He started as a bell boy in the early 1900's on the trams. After the first world war my dad worked out of the shed as a driver until the second world war in 1939. When he returned in 1946 he again started as a driver, he was the first driver in the new #4 route that went up Bury New Rd, and this is where I can't remember where it went to, memory you know, but he took me one Saturday and we went out into the country, past Bury, I remember an old woman at the end filled my Dads tea can for him and gave a chocolate digestive and a glass of Dandelion and Burdock to me. In later years after I came out of the army, my dad got me a job as a bus conductor while I was waiting to be hired at the Manchester City Police. I remembered ringing that bell, one for stop, two for go and three for emergency. I met a lot of very nice people on the buses, and the only trouble I had was on the 121 to Langley on a Saturday night. Last Saturday I went to a classic bus event at the Museum of Transport in Cheetham. It was to celebrate the 50th anniversary of Buses magazine, published by Ian Allan, and to mark the 20th year that the Museum has been open ot the public. There were old buses from other parts of the country, as well as some from the local area I hadn't seen for years. The North Western Bristol for instance is a bus I remember taking as a child - it was almost a time-travelling experience to ride on it again. I also took the green Bury double decker, superbly restored, it almost looks new and you have to admire its robust and practical design features. The old-fashioned front-engined double decker is a superb piece of British design, and is still in daily use on the streets of London. Inside the museum you can see the changes in bus design and in local transport organisation from the beginnings of public transport right up to the present day. way home from work on a fixed gear bike. 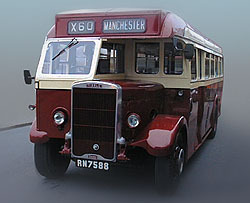 The red and cream livery with "streamline" stripe along the side was the pre-war Manchester livery. During the war, a plain livery was introduced, but the curvy stripe survived on many buses into the late forties. For pictures, see the excellent "Looking Back at Buses, Trams and Trolleybuses", details at the end of this feature. Yelloways used to operate long distance coach services from the north west to London and the south west. You can see their old timetables and adverts at the excellent Museum of Transport - make sure you visit the next time you're in Manchester! You tend to see lots of men at bus events - many wearing woolly caps and anoraks - and hardly any women. Sadly an interest in buses and bus design is considered the domain of nerds, while an interest in interiors, textiles or fashion is regarded as very cool and trendy. It makes no difference to me, whether I'm taking a picture of a glamorous supermodel or the number 7 to Cadishead, though supermodels are slightly easier to photograph as they keep still when you want them to. And in my opinion "looks like the back of a bus" is a compliment. Exterior: Mostly single primary colour with stripe - all white or cream livery at seaside resorts, small adverts. Interior: Increasing use of fluorescent lighting, use of plastic and "fake" wood effects. Smoking upstairs discouraged - finally prohibited early 80's. Exterior: In Greater Manchester, a bright, "modern" livery (I think very tacky and now very dated) of white and orange was introduced with the creation of "Selnec"
Rear transverse mounted engine now standard, now more powerful, quieter, smoother and cleaner than before, destination display roll increasingly replaced by digital matrix, "kneeling" buses for better access, computerised ticket machines. Exterior: Widespread use of pastel and brighter colours, giant adverts on rear or whole exterior. 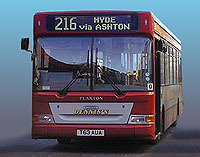 Most local bus services run by small number of large operators and many small operators, nearly all privately owned. Local bus transport is more than just getting people from A to B - it's an integral part of life in the conurbation, and a key factor in the quality of life. The Latin word "omnibus" "for everyone" but there are some people who haven't taken a bus for years. Those who've graduated upwards in social or income scale, or have always been there, often travel exclusively by car, and wouldn't dream of getting the bus - it would be like a "come down" for them Others rely on the bus, particularly those at the younger and older ends of the age range. And those at the lower end of the income range rely on the bus, and other forms of public transport - students and the unemployed for instance. 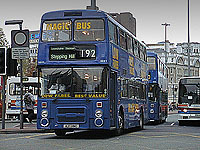 Some companies target these groups, such as the Stagecoach-owned Magic Bus. I regularly take the bus - I enjoy it. It's nice to look out the window at the city, and to share the travelling experience with other people. There are some people, however, who I'd rather not share the same space with: All it takes is one group of youths on the upper deck at the back, spouting obscenities, or worse, and I stay on the lower deck or get off. I was downstairs on the 50 on Monday afternoon, and heard a scuffle upstairs - someone had been stabbed and an ambulance had to be called. If there had been a conductor, this may not have happened, which brings me on to my next point. 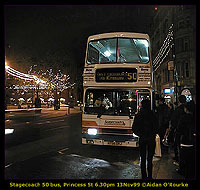 The bus service of 40 years ago was better, quicker, more efficient and more enjoyable to ride on than those of today. Manchester still had trolleybuses - like a bus but electrically powered from twin overhead wires - non-polluting, quiet - a brilliantly attractive form of municipal public transport Trolleybuses axed in the early sixties, a very short-sighted decision in view of the oil crisis ten years later - the closest thing we have now is the Metrolink tram. The onset of the fad of modernity, with its fashion for acronyms and simplified logos, meant the attractive diverse coats of arms of local corporations were replaced by the meaningless "Selnec" (South East Lancashire North East Cheshire), with two opposing dart fins on the upper right and lower left. In 1974 this in turn was replaced by an even more unimaginative logo, a bendy double-line M for Manchester (actually Greater Manchester), representing perhaps the circuitous route of a one-man bus taking ages to get to its destination. I remember around 74-79, bus transport went down-market - the oil crisis brought huge jumps in fares, economic problems caused lack of investment and a deterioration in service. The yukky orange and white livery, painted on all buses in Greater Manchester, was meant to usher in a new age of efficiency and modernity, but for me it represents the cost-cutting ineptitudes and dubious design values which were a common feature of the 1970's. 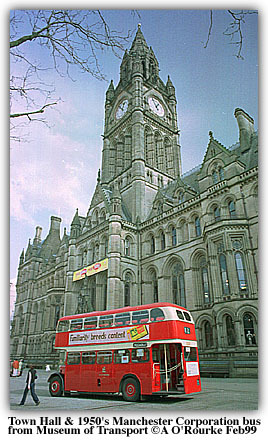 In 1986, the Conservative government privatised the buses, and the long-winded "Greater Manchester Transport" became the unmelodious "GM Buses". Since then, companies were bought and sold, there's been consolidation and concentration, and Stagecoach, started by a Scottish woman called Anne Gloag, now one of the richest women in Britain, has taken over many bus services all over the UK. In Manchester, they operate mostly in the south of the conurbation. FirstBus, another national company, runs the buses mostly in the north of the Manchester area, and there are many other smaller private operators.